Getting through the winter seems to be so complicated and expensive for us humans. On the other hand, in the tropics houses are simple. All you really need is a roof that keeps the rain out, screens on the windows (or a mosquito net to sleep under), four walls and a floor. Winter is the reason that human civilization has primarily stayed in places where nothing ever freezes. Winter is an enormous economic drain. Which makes me wonder how all these animals up here manage to make it through the winter without ever paying a cent for oil, gas or electricity to heat their homes and yet keep living and carrying on just fine without all the complexities that humans seem to require. The secret is going underground …and falling into a stupor …waking up every few weeks …seeing if it’s over …falling back into a stupor …again …again …unless something eats you. Take the Mongolian Gerbil of South Central Siberia, for instance. Don’t be fooled by that “Siberia” name. Siberia is just the prairies or “western plains” of Russia. It’s no colder there than Manitoba (that’s Canada) or North Dakota, where actually it’s incredibly cold, as cold as Siberia. In the winter they… wait, apparently they don’t hibernate. The whole family moves down into their winter nesting chamber which is 4 or 5 feet below the surface. They store up food? Probably. The burrow is interconnected with tons of other ones. I think they have a pretty good time down there. They don’t shovel snow. They stay underground on super cold days, which means, super windy days. I think they carry the Plague. Weird stuff happens in the winter up here. Some small rodents, ground squirrels, I think, hibernate. Hibernation isn’t “sleeping”. Hibernation is a (this is true) state of suspended animation where the body temperature drops to within a few degrees of “room temperature” which in these cheap, unheated rodent-homes, could be close to zero (freezing) Celsius. Pick up a hibernating animal and drop it and it won’t wake up. It’s in a torpor or stupor sort of state. Most hibernators however, dig a burrow down to a level which is below the “frostline”, which is the maximum depth to which the freezing cold of winter goes. There’s something called the sub-snow layer, too. Under the snow, but above the ground. Not as exposed, but certainly colder than the subterranean areas. Bears, or at least most bears, don’t actually hibernate. They just lie around sleeping or doing nothing all winter. Apparently this was discovered, quite quickly, by researchers who went into the dens of bears in the winter to take their temperature (the main indicator of hibernation). After the loss of several hundred graduate students… it was assumed the bears were not hiberating and were actually quite alert. Some small rodents actually allow their body temperature to drop below freezing and enter a super-cooled state (below freezing, but still liquid –not frozen). This allows for enormous savings in heat as a body temperature of -2C doesn’t require much metabolic activity. It’s been suggested that perhaps, in particularly cold winters, or during cold “snaps”, that some of these rodents actually die, so maybe it’s not as successful a strategy as one might think. In the Arctic (snow, ice, tundra, igloos, seals, polar bears…) apparently there is very little or actually no hibernation (low body temperature state). Why? Isn’t it colder up there? Yes, but the winter lasts so long (like 14 months) that no animal could store up enough fat to make it through such a prolonged period. Polar Bears are active all winter long. They even give birth in the winter. They eat people too. They’ll eat anything. I read about an experienced Inuit (Eskimo) hunter who was stranded on an ice floe and was scared to death about being killed by polar bears, especially at night. It just amazes me that anyone or anything would live way up there. The squirrels of the Yukon Territory (Canada, east of Alaska) are the weirdest of all. They don’t go underground, or hibernate, they just avoid the really, really bad days. They’re active all winter long and instead of having an increased metabolism which is what you’d expect, since they’d need to supply more body heat, they have a lowered metabolism —yet they do not die. And they live in trees, in nests made up of a big ball of twigs and leaves. You cannot freeze a squirrel. It’s been proven. They have to be run over first. Or go through a snow blower. I don’t live in the Yukon, but even here, way down south in Toronto (between Michigan and New York state) squirrels live up in trees all winter long. This has always puzzled me, because it looks incredibly cold, especially on windy nights. The trees are bare except for these strange, football sized clumps of leaves. You’d expect people to live that way, but not animals. Maybe living so close to people has made them stupid and they’ve abandoned the steady ways of their ancestors. But for the Mongolian Gerbil, when it’s night time; minus forty; the wind howling away; he’s quite relaxed, down in his golden chamber, surrounded by the riches of the earth, while a winter storm walks across the plains. 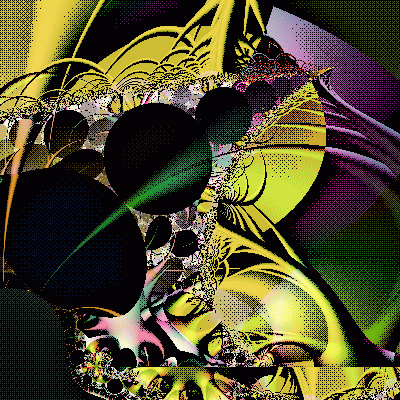 Is Ultra Fractal Really a Fractal Program or Is It a Bold New Spaceship By Which To Explore the Algorithmic Heavens? 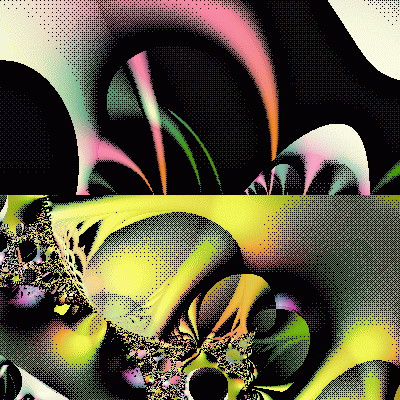 Is it too late to patent your fractals?